A shot timer is a small device that measures the amount of time you take for each shot or for every series of shots. While it is usually used in competitive shooting, some people use it to improve their shooting skills. The best shot timer tells you the promptness and accuracy of your shooting skills to help you determine the areas that you need to improve on. This small piece of device may be quite expensive so only buy the one with the best features. There are several factors to consider when buying one. The display is the most important since the main purpose of a shot timer is to show the information essential during shooting. It must record accurate data in sufficient storage, and its battery life should last for long. It must also have a durable built for rugged use and protection. For improving on the areas you need to address in your shooting skills, the first accessory you should have is a shot timer. There is no alternative but to choose only the one that measures and show the most accurate data. The first one on our list is the PACT Club Shot Timer 3. This device boasts a minimalistic design that is combined with features that could best match your needs. This could easily be the best shot timer in this price range. While some users might find it quite expensive, it does come with features that make it all worth it. Do you think this is the model you’re looking for? Let’s find out! 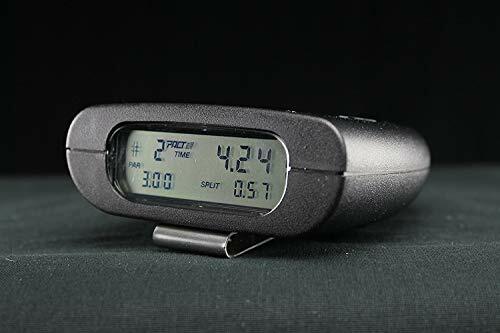 As mentioned, the very first thing that most would notice about the PACT Club Shot Timer 3 is its minimalistic design, which is rather unique and ergonomic. It perfectly fits the hand in a way that the microphone and the buzzer are unbarred. Weighing only five ounces, this device is really portable and does not hinder performance. The simple built is quite durable too. It is encased in a rust-resistant material, and the keypad is made of conductive rubber. The buttons are lowered a little so that the user won’t accidentally press them or activate the functions without him knowing. Another important feature of the PACT Club Shot Timer 3 is its ability to measure accurate numbers of shots, split time, and total time. All of these data are hown in a large, multiple-display screen that is comfortable and easy to read even while in action. The PACT Club Shot Timer 3 also boasts a 100-shot memory. This memory automatically compresses the data so as to be able to free more storage space. This device also has a battery-saving function in that it automatically turns off when it is inactive for several minutes. Moreover, this shot timer also has a loud buzzer with a low frequency. This feature emits a clear and comfortable tone for the use and fellow shooters. Lastly, the manufacturer backs this device with a factory limited lifetime warranty. Used by professionals and shooting champions, the CED7000 Shot Timer is guaranteed to be of high quality and offers accurate readings. More than that, it is relatively less expensive than other shot timers as well. What does the CED7000 Shot Timer has to offer? Let’s check it out below. 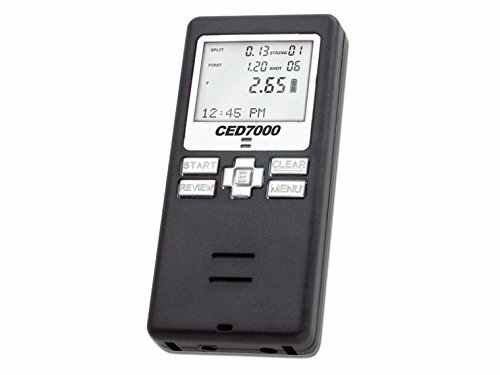 The CED7000 Shot Timer features an illuminated LCD display that shows the times, date, and PAR timer, as well as functions such as review and split time. It also has different modes including countdown mode, automatic start, and more. This shot timer is proudly one of the first models that are equipped with a rechargeable battery. Its small built easily fits in hand. In fact, it measures 100 by 47 by 17 mm and weighs only 2.9 ounces. It is one of the lightest and smallest shot timer you could find in stores today. For function and comfort, this device comes with an adjustable loud beep and options for silent mode, spy mode, and stopwatch mode. It also has a customizable soft beep for dry fire use. The CED7000 Shot Timer comes in a complete package with wrist lanyard, neck lanyard, and two-voltage charger. Last but not least, we found that the Competition Electronics Pocket Pro Timer II is also a good buy. Although it is much less expensive than the other two shot timers, it should not be underestimated. After all, it is loaded with features, functions, and advantages that are vital for improving shooting skills. 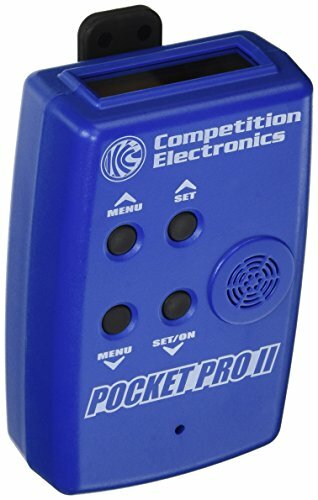 The Competition Electronics Pocket Pro Timer II features multiple functions such as PAR time, split timing, review mode, and delay start buzzer. The display can be easily configured in three ways to best suit your needs and accuracy. It comes with replaceable one by nine voltage or nine-voltage Polaroid batteries. It lasts for long because it automatically shuts down after 10 minutes of inactivity. The Competition Electronics Pocket Pro Timer II comes in a blue-colored case with a big belt clip so that you can conveniently hang it while shooting. The device is especially loved by beginners. The menus are easy to navigate and remember, and the large buttons are spaced for large fingers. The buzzer is also loud enough with 105 decibels sound that passes through ear protection. The sound also comes with adjustable sensitivity to suit different needs and comfort. Considering the factors essential in a shot timer, such as the display, accuracy, battery life, durability, and features, the above-mentioned shot timers stand out in the market today. They have the best features as well as minor drawbacks, but overall, they best match every shooter’s needs and preferences. Most high-quality shot timers have a price range that does not go below $100. Being able to find a less expensive brand with features and quality that are almost similar to more expensive models is a jackpot. Taking into consideration the backlit LCD display with three configurable settings at a reasonable price, the Competition Electronics Pocket Pro Timer II can be considered the best of the best of the three shot timers on this list.